This great Lake Michigan fishing charter boat calls Northpoint Marina located in the Wisconsin Illinois border town of Winthrop Harbor Illinois its home. It is conveniently located 1 hour North of Chicago and 45 minutes from Milwaukee. The benefit is location on some of Lake Michigan’s best fishing grounds. The Confusion, is a Pacemaker 38 Foot Flybridge Sportfishing vessel. This Lake Michigan Charter Boat is 14 foot wide & built solid to ride comfortably on big water. The “Confusion Too ” features the ultimate in comfort & full amenities including enclosed washroom facilities and safety equipment. State of the art electronics and the finest tackle available make this the true ultimate Salmon & Trout Charter fishing vessel. Abu Garcia 7000 Reels, Shimano Tekota Reels, Shimano Fishing Rods and all of the finest fishing tackle available for Lake Michigan Fishing. 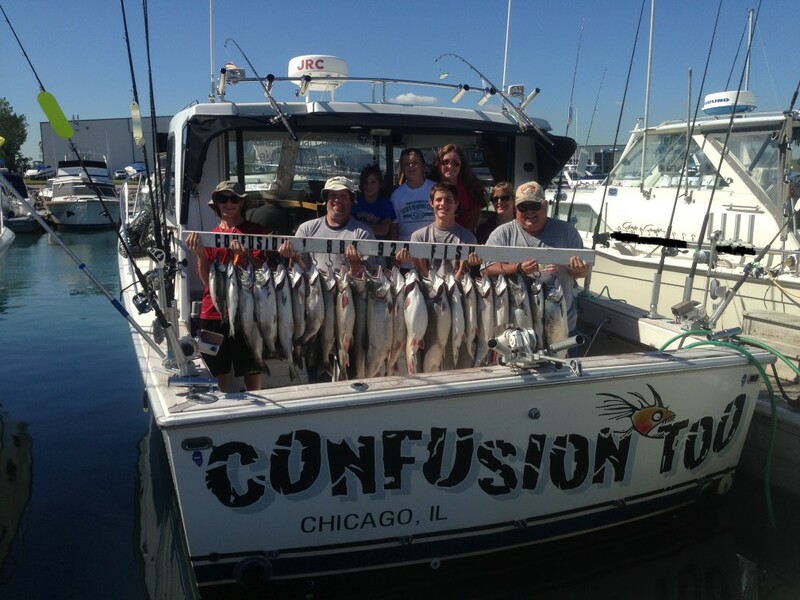 Lake Michigan Fishing Charters Inc.